Winters in India can be quite unforgiving, especially if you live in Kashmir, Himachal, Sikkim, or Punjab. Therefore, a heater can often be a necessity rather than a luxury to keep ourselves warm throughout the cold season. Oil filled radiator heaters are recommended because aside from keeping you warm, they also maintain the moisture levels of a room. 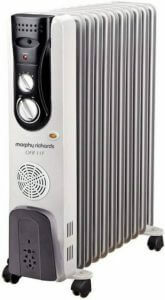 Sometimes called oil filled radiators, oil filled room heaters or oil filled heaters, these appliances come in a variety of models from brands such as Morphy Richards, Bajaj, Sunflame, and so on. 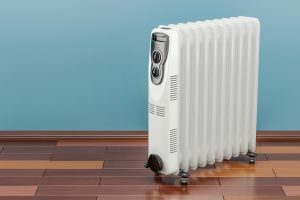 This article will discuss how you can choose the right oil heater for yourself, and introduce the top 10 picks for oil heaters you can buy online in India. 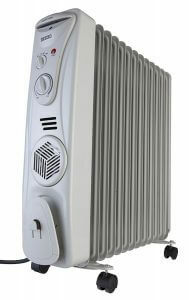 Oil filled radiator heaters are an energy efficient way to keep your house cosy during the winters. Although they take a while to heat up, they are sure to keep the room warm and comfortable for a much longer time. The heating element in oil heaters is dipped in silicone oil to maintain the oxygen and moisture levels of a room. Oil filled heaters come in a number of sizes and can have different features, which makes it difficult to select the right one. Here are a few important points you must consider to choose the best oil filled radiator for your needs. 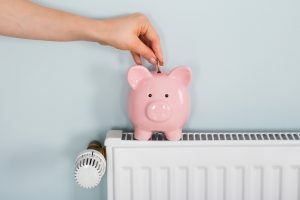 It is extremely important to choose a heater based on the size of your room because otherwise, it will either end up being insufficient or too expensive for your need. A 9-fin to 11-fin oil heater would be better for a smaller room like the bedroom, while a 13-fin to 15-fin one would be more appropriate for a larger area such as the dining room. It is also better to buy an oil filled heater with taller fins rather than shorter ones as the heat tends to get distributed in taller fins thereby making the surface heat up lesser while producing the same amounts of heat as compared to the ones with shorter fins. The price of an oil filled radiator varies depending on a number of factors such as the size, the model, and the kind of oil used in it. Although additional features like an adjustable thermostat to control the heat or an auto-cutoff to save electricity, may seem appealing, they might not be necessary for all of us. Those living in warmer parts of the country would not need a huge oil heater with multiple heat settings, so it would be alright if they opted for less expensive models. However, all those living in the northern and north-eastern states would have to invest a little bit more because winters are more severe in these regions, and having an adjustable thermostat or more number of fins would be really useful. 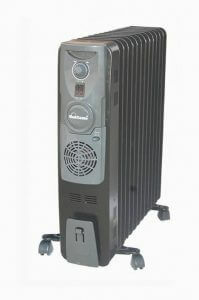 While choosing an oil filled room heater one of the most important things to keep in mind is its durability. Ideally, an oil heater made out of steel is sturdy, durable, and easy to maintain. Furthermore, since steel doesn’t rust, these types are usually easier to clean. Nowadays, there are also steel oil heaters that come with an enamel coating, which really makes the process of cleaning them a piece of cake. 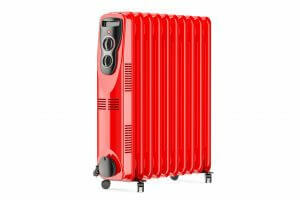 We shall now reveal our top 10 picks for the best oil filled radiator heaters you can buy online in India. We hope these will help you find the right oil filled heater for your needs. Anyone who needs a sturdy heater for small to medium-sized rooms should consider getting this one! It is recommended for those who do not face severe winters and do not need heaters with too many settings. It also has a safety tilt switch to protect you against any kind of shock in case the heater isn’t installed properly. On the downside though, this heater takes almost half an hour to warm up even a medium-sized room, and it is very noisy as it creates clicking noises after it’s been turned off. It also consumes a fairly higher amount of electricity, almost 30 units per day, so your electricity bill might end up being quite a lot. If you live in a region which only has mild winters, then this radiator should be on your must-buy list! It is perfect for smaller rooms and is safe for households with kids as well since the outer surface does not get too hot. It comes with an auto-off feature, so you do not have to worry about endless electricity consumption while using it. The biggest downside to this product is its slow heating as even in small spaces, it can take quite some time to warm up. Despite being pretty expensive, it lacks a PTC fan and although it has three heat settings, none of those are very warm. Therefore, it is not recommended for those living in colder parts of the country or those on a budget. 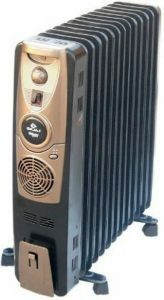 If you’re on the lookout for a robust yet portable oil heater, this one will be perfect for you. 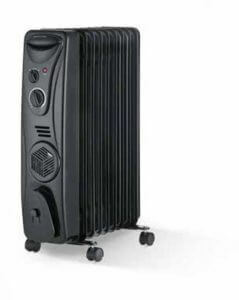 It is a sturdy and easy-to-use heater to help keep your room warm and cosy during wintertime. Absolutely noiseless in operation, it is great for heating medium sized rooms, and you can easily take it from room to another as it is not too heavy. One of the biggest drawbacks to this product though is that it may sometimes give off a burning smell while in use, which may be a problem for those with sensitive noses. Furthermore, it may be a bit difficult to operate as the heater buttons do not have markings and the adjustable thermostat is merely a dial without any indicators. 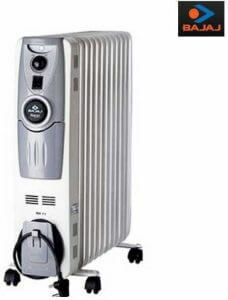 If you’re looking for an affordable oil heater for a fairly larger space, then this is the one for you! It is one of the cheapest 13-fin oil heaters and it comes with a built-in PTC fan for faster heating, which is absolutely noiseless when switched on. Since it has three heat settings, it is recommended for those living in the northern regions. However, it does not have a temperature indicator nor a tip-over safety switch, and any kind of breakages or short circuit are not covered in the one year warranty. The built-in PTC fan is a great feature for faster heating but, it adds to the weight of the heater, making it slightly heavier and more difficult to carry. This 11-fin oil heater is great for small to medium-sized rooms and is recommended for those who live in areas with severe winters. It has a PTC fan for quick heating, an adjustable thermostat to control the temperature of the room, and it automatically stops heating once it reaches the desired temperature to avoid overheating. Being a 2900 watt oil heater, we feel that it is slightly higher in power consumption and thus might be heavy on your monthly electricity bill. 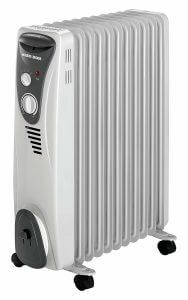 It is not recommended for those looking for economical options since aside from the running costs, the initial cost of buying this heater is pretty high too. This is the perfect radiator for those who need fast heating in small to medium-sized rooms! It has four heat settings and a separate adjustable thermostat dial, so it is recommended for those who have to deal with harsh winters. It also has a PTC fan and works best for 150 to 200 sq.ft rooms, warming them up in just 15 minutes! Although, this heater is not great for rooms larger rooms with 350 sq.ft and above areas, and since its outer body can get pretty hot while in use, it is not recommended for households with kids either. The PTC fan may become a bothersome feature for some too as it can be quite noisy and make it harder to fall asleep. If you’re looking for a well-made, noiseless oil heater to fit into a small space, then this is the one for you! It has three heat settings, and each of these can be controlled with a second dial to minimise or maximise the pace of heating. There is also an additional fan, which can be turned on to speed up the process of heating. However, it is not the most affordable option on the market and may seem too expensive for its size, therefore if you’re looking for a budget-friendly option, then this isn’t for you. Furthermore, the switch for the additional fan is located at the back of the heater, which may be hard to reach after the heater has been in use for a while. 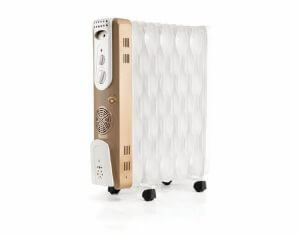 This is the perfect heater for those who want to buy a heater that not only works efficiently but is also aesthetically appealing. It is particularly recommended for households with kids as the coating on the heater prevents the outer body from overheating. The coating also makes sure there is no rust, so it is much easier to clean. It has three heat settings and it can be used continuously for several hours, so it is great for those living in colder regions as well. It is safe to use this product extensively for long hours, and although you shouldn’t, in case you do face any issues, it comes with a 1-year warranty, so you can always get it fixed without any worries. Recommended for anyone who needs a noiseless, quick-heating radiator, this will help you stay warm in severely cold north Indian winters. It can warm up medium-sized rooms within 15 to 20 minutes, and it can be used all through the night as it doesn’t cause any suffocation and works almost noiselessly. Furthermore, it comes with a thermostat feature, so it turns switches to standby mode and maintains the desired temperature once it has been reached, which helps decrease electricity consumption. It also comes with a built-in PTC fan and three heat settings to make sure you are fully prepared to handle the weather. One of the best heaters on the market, this is perfect for 150 to 200 sq.ft., rooms, and it takes about 15 to 20 minutes to make them warm and comfortable. You can use it for almost 15 hours a day without any issues as its thermostat feature will automatically switch to standby mode once its warm enough to save electricity. It is the most affordable product on this list and is recommended for those who do not wish to spend too much on a noiseless radiator. It works perfectly even in severe north Indian winters as it has three different heat settings. It also comes with a 2-year warranty, so in case you have any troubles, you can easily get it repaired. 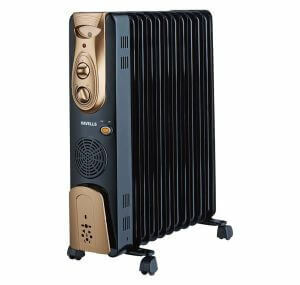 Oil filled heaters are the perfect solution to cold, dry winters, especially if you want to use them in smaller rooms. They do not make the air in the room any drier, therefore, they’re particularly good for children and elderly folk. They also keep the room warm for longer, which is especially useful in areas with frequent power cuts. Furthermore, they consume less electricity and keep the room warm for longer, so let’s try to choose these types of heaters over the other, less efficient types! 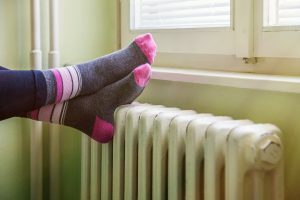 Oil-filled radiator heaters may seem like an unnecessarily expensive product, but they are extremely useful for families with kids or elderly people as they maintain the moisture and oxygen levels. They’re also great for those living in the north of India to make winters more bearable for you. Once you start using these types of heaters, you will realise how cosy and comfortable your homes can feel even during wintertime. We hope this article has helped you understand how you should choose the perfect heater and that you were able to find a suitable one for your home.